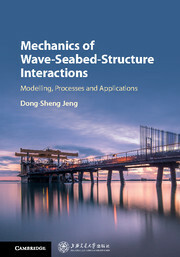 Opening with recent advances in both the theoretical and physical models for wave-seabed-structure interactions, this book provides an updated look at the mathematics behind the interactions between sea, soil and man-made structures. The main models are broken down into key equations, and their strengths and challenges are discussed. These models are then placed in context with industry-relevant examples, in both two and three dimensions. From seabed instability around offshore wind turbines, to soil conditions in response to the laying of submarine pipelines, this book takes a comprehensive look at a variety of wave-seabed-structure interactions. With important implications for the future of offshore infrastructure, this is an ideal resource for industry workers, undergraduate students, and researchers. 1. Overview; 2. Basic seabed mechanisms; 3. Soil response in marine sediments under combined loading of waves and currents; 4. Integrated model for wave-seabed interactions around caisson-type breakwaters; 5. Mechanics of wave-seabed-pipeline interactions; 6. Wave-seabed interaction around breakwater heads; 7. Seabed instability around offshore wind turbine foundations; 8. Physical modeling: one-dimensional compressive tests. Dong-Sheng Jeng is a Professor at the Griffith School of Engineering, Queensland. His main research interests include coastal and ocean modelling, offshore geotechnics, and wave-seabed-structure interactions around marine infrastructure, which he has been studying for over twenty years. Alongside his research, he has authored or co-authored over 250 journal articles, and is an associate editor for a number of journals in the offshore engineering field.